The best way to spread Christmas cheer is singing loud for all to hear! BARK THE HALLS! 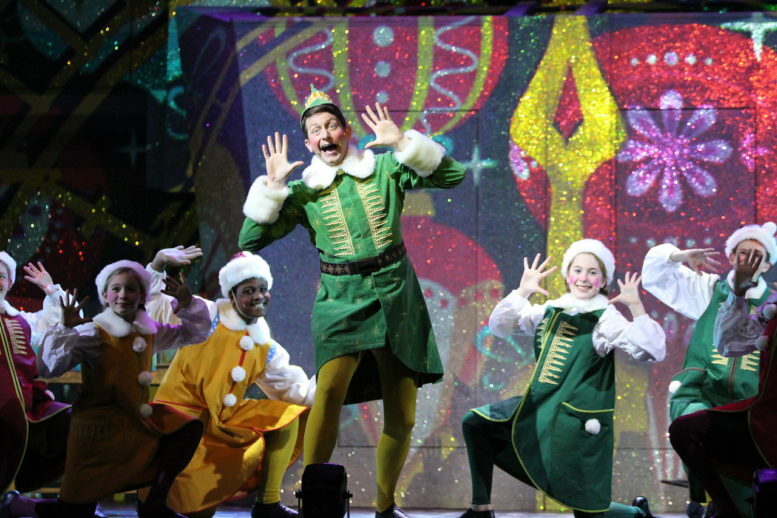 Elf The Musical is a resounding hit at The Rose Theater! I am going to be singing all the energetic songs all holiday season, especially sparklejollytwinklejingley, Christmastown and… well… ALL OF THEM! 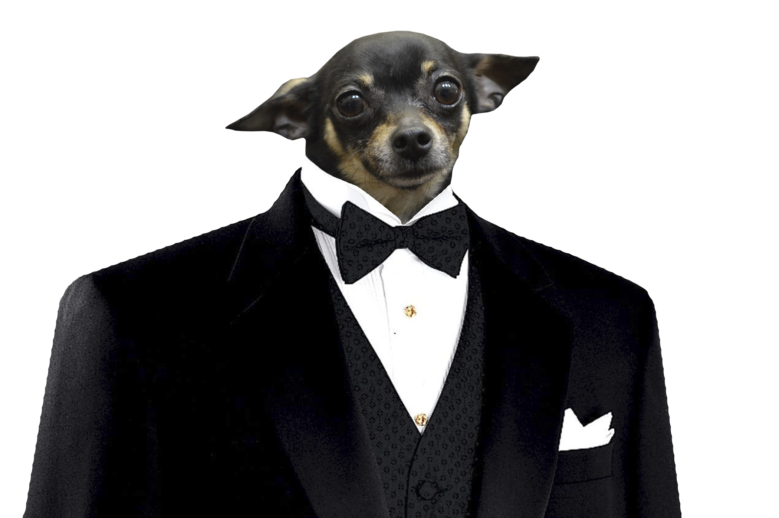 It’s a dogs dream to walk into a winter wonderland like The Rose, where the lobby is filled with cheer and joy, and then to enjoy this holiday hit, well, it was paw-sitively perfect! 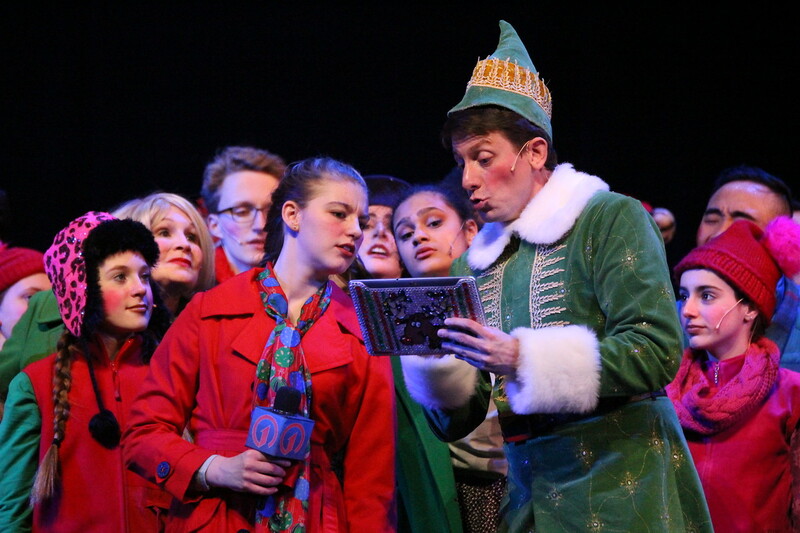 The story begins when Buddy (Dan Chevalier) gets the news from his best pal Santa Claus (Zach Kloppenborg) that he is, in fact, human. Buddy embarks on a Christmas quest to find his real dad, workaholic Walter Hobbs (Anthony Clark-Kaczmarek) and a new life in New York! His hijinks lead him to Macy’s where he finds the most beautiful elf he has ever seen, Jovie (Regina Palmer), and he has to instill Christmas joy into Jovie and all the other elves he encounters, as well as his own family! 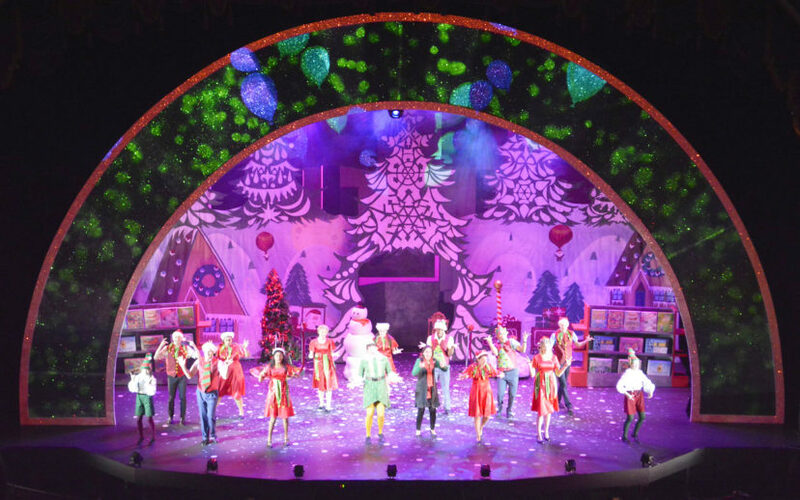 The cast, comprised of 28, brings energy and life to the stage, while dishing out one-liners and holiday hilarity at the same time. Plus, they all came to pet me after the show! I guess wearing my elf outfit paid off after all. Oh, I can’t forget about the set. The projections. The lights. The dancing. The singing. It was like unwrapping a beautiful milk-bone on Christmas morning. The photos just don’t do it justice. It reminds me of the time I was walking through the park and all the lights were hung on trees, cascading across the powdery snow while I trotted along the trail and — sorry I am getting carried away with my nostalgia. The point is, this show is magical, it’s high energy, it’s sentimental, it’s everything you could ask for and more. It brings those warm, fuzzy feelings you get when you take a step back from all the craziness of life and just enjoy time with your family around the holidays. We can all maybe relate to Walter Hobbs in some way, but in the end, we all just need a Buddy to remind us the important things in life. Now I am getting all sentimental! Get your tickets while you can, because this show is selling out fast! It is a can’t-miss event and you will surely leave laughing and singing all the way to Christmas! @ The Rose Theater and send us a message!